At the time of writing in mid September, after a few rain free weeks during the London Olympics, the sun is shining and those beautiful flowers of autumn, dahlias, Michaelmas-daisies and the red and pink flat headed flowers of Sedum spectabile are covered with honey bees, bumble bees and the occasional butterfly. This morning I spotted a small blue (Cupido minimus) which is normally seen in May/June and is, as the name implies, small, just 50mm wingspan with dark blue colouring on the insides of the wings and pale silver-blue with a curving line of black spots on the reverse. Last weekend the warmer, drier weather resulted in a late crop of red admirals; the red, white and dark brown splashes of colour looking as though they had just jumped off an artists palette. As some of you will know Outwood Women's Institute recently held a fascinating open meeting at their September gathering when the guest speaker was Jenny Clark who runs a bat rescue centre in Forest Row. Jenny came equipped with two large and mysterious looking black bags. She started with an explanation of her background which was working with horses and that her interest in bats was first sparked when someone brought her an injured bat and asked if she could help. It quickly became apparent that she was completely captivated by these small flying mammals, had amazing patience with regard to the care of injured animals and was a complete expert on her subject. After a short introduction she delved into one of the black bags and withdrew a folded, soft cloth and lifted out a pair of bats which she put onto her blouse and held them in place with white cotton, gloved hands (she put on clean gloves each time she handled a different bat); then, still talking, she walked between the rows of seats so that everyone could see the bats close up. One of the species was the common pipistrelle (Pipistrellus pipistrellus) weighing just 5gms but capable of eating up to 3000 tiny insects each night. 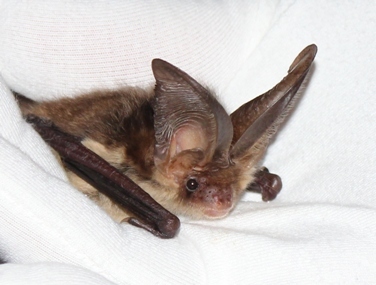 The highlight of her talk was when she showed us a brown long-eared bat (Plecotus auritus). This species weighs around 12 grammes with a wingspan of 285mms and some have been known to live for 40 years. At close quarters one is able to appreciate the extraordinary design of their ears, which provide their echolocation facility - the photograph shows the large ears which collect the sounds and then bounce them onto the smaller ear flaps positioned to the front which then direct the sounds to the brain. However, they are relatively slow fliers and unlike our other bats they rely rather more on their eyesight when hunting for food such a moths and other insects. There are eighteen species of bats in the UK of which seventeen are known to breed here and this represents almost a quarter of all of our mammal species. Other wildlife news comes from Marion Warner who found two adult hedgehogs in her garden and Shan Daniels who reported a nuthatch that took residence in one of her bird boxes and managed to produce nine fledglings. As a result of the bad summer nature has been playing one or two tricks; David Thomas has just one apple of Laxton's Fortune in his orchard of more than fifteen trees and David Baldock reported that in late August he saw a group of spring flowering wood anemones in Hornecourt Wood.